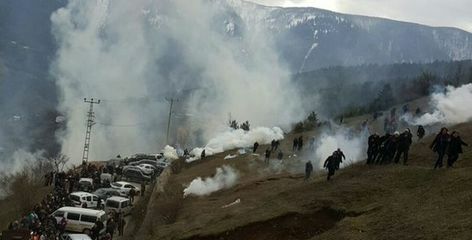 Residents of Artvin, a small town in the North-eastern Black Sea region in Turkey continue to resist the opening of a dangerous gold and copper mine in the Cerattepe area for more than 20 years. After years of resistance, several mining companies, and several court rulings against the project, the conflict is still on-going. The first attempts to mine the gold and copper in the area started in the beginning of 1980s. After several years of explorations, the first mining license was given in 1987. In the early 1990s, the license was transferred to the international mining company Cominco, who started further explorations and test drillings. Even after the test drillings, the negative effects were observed immediately when livestock died suddenly. At that point, residents (who were thinking of the mine as a new income and employment source) started to reconsider the mine in the area as a threat. Since 1995, a resistance movement started to be organised under the newly founded Green Artvin Association. In 1998, a petition with more than 10.000 signatures was delivered to the ministry of environment, which in turn halted the project for re-investigation. Unable to start mining due to local opposition, Cominco left the mine in 2004 and transferred the license to INMET Mining, who tried to re-start the project. However, the Green Artvin Association and lawyers from Artvin Bar took the project to the court, which ended in 2009 with a cancellation of the previous mining license. However, in 2012, a new mining license was issued by the government and Cengiz Holding (under the roof of Ozaltin Insaat) who filed a EIA request and get a positive report soon after. In January 2015, Rize Administrative Court overruled the project’s positive EIA report. However, with an outstanding rush and within very short time, the mining company has received another positive EIA report despite the court ruling, giving right to a renewed permit to mine in the area, with supposedly newer technologies. Another complaint prepared by 61 lawyers has been filed in July 2015, with the signature of 751 people, making it the most extensive environmental court case in Turkey’s history . The case is still ongoing and the examination of panel of experts has been awaited in these days. 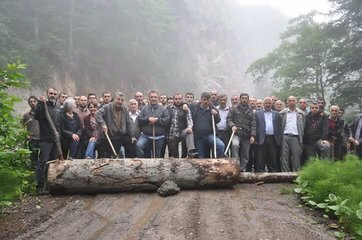 Since July 2015, people of Artvin have reacted to the advances by the company, and started to keep a continuous watch by barricading the road leading to the planned area. The protests has received nationwide supports from several local and national NGOs. Project Details In the previous plans, the project had the aim to mine the gold, silver, zinc and copper, with an open pit method. However, after the cancellation of the EIA due to the adverse effects of gold mining and leaching, the project is renewed by the company. In the current EIA report, the objective of the project is put forwared as developing a closed pit copper mine in Artvin Cerattepe, from where the copper concentrate will be transported by teleferic and motorway to the ETİ Bakır Corp. for the flotation process. The raw ore capacity for copper is 500.000 ton/year. The EIA report mentions the gold, silver and zinc concentrates as well, but does not provide any information about whether these metals will be mined and leached together with the copper for economics purposes. Cengiz Holding from Turkey - Cengiz Holding rents the mine from Ozaltin İnsaat. Why? Explain briefly. The local residents have managed to prevent any attempts to open the mine since more than 20 years, in that sense it is a success. However, the plans for mining projects are still on going. The court case is still going on, as well.